Introduced as an all-new model in 2008, the BMW X6 receives a couple of equipment and package enhancements for 2009. The Premium Package now features an automatic tailgate. A leather-wrapped dashboard is available, and heated rear seats are now included with the Cold Weather Package. 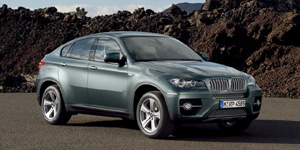 Find the used BMW X6 of your choice from a dealer in your area. Search our used car listings now.